One of the regular questions we get when talking with contractors is “what is lead generation.” Although lead generation is a common marketing term, it can be confusing. We demystify lead generation, explain what leads are, and outline what to consider when looking for a lead generation company. Simply put, a lead is a potential customer or sale. 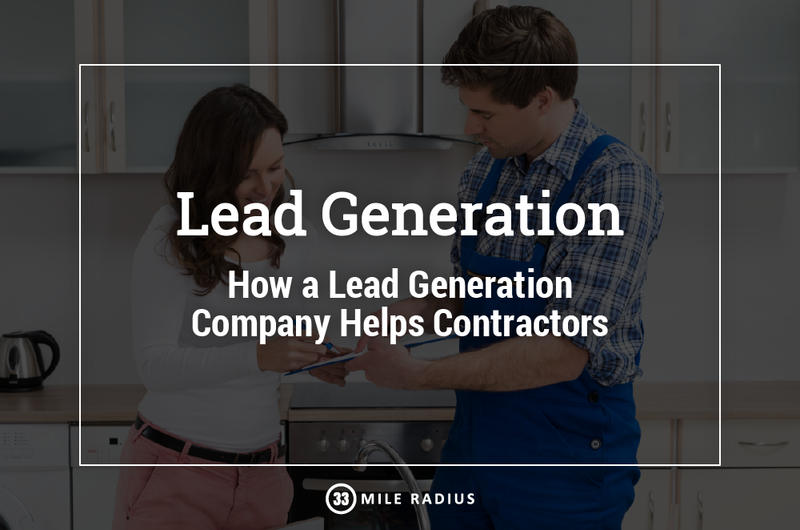 For contractors, a lead is a potential customer looking for a service you provide. In most cases, contractor leads are phone calls. However, leads for contractors may also be text messages, emails, or messages on social media. Unfortunately, not every lead will turn into a customer or sale. Some leads are price shopping, while others will go with another contractor. Lead generation is the business term for identifying potential customers or sales. As a contractor, any method you use to get more customers is a form of lead generation. This includes every way you market or advertise your company. If you’re running ads, you’re trying to generate leads. Even asking customers for reviews and referrals or posting on social media are types of lead generation. Generating leads and getting more customers takes effort. While asking for a review or putting your phone number on your truck are pretty easy, other types of marketing and advertising are more complicated. Advertising, especially digital advertising, requires constant attention and adjustments to ensure campaigns perform. Creating SEO content that attracts potential customers requires time and effort to effectively target keywords. Although social media is technically free, you usually need to pay to promote posts so potential customers see them. A lead generation company is like hiring a marketing and advertising agency. A good lead generation company has both a strong background in sales and marketing skills, but also a solid understanding of the services you provide. This ensures they are correctly marketing the services you provide to customers looking for them. Lead generation companies produce opportunities for contractors through a variety of ways. Most lead companies generate phone calls, but some also send text messages or emails with customer information as well. As a contractor, you agree to pay a specific price for each lead. The terms and conditions for billable leads will vary by company. Just like the leads generated from your own marketing efforts, you are buying an opportunity and not a job. There are two main types of lead companies: exclusive leads companies and shared lead companies. Exclusive lead generation companies sent their leads to only one contractor, while a shared lead company will send the lead to several contractors at once. Every lead generation company is different, so it’s important to research several companies and find the best fit for your business. Look for a lead generation company that has a clear pricing model so you know how much each lead will cost you up front. This ensures you know how much you’ll be spending and won’t get hit with surprise charges or fees. Steer clear of companies that hide the prices of their leads, make frequent changes to lead prices, or will only disclose pricing after you sign up. You should know exactly what constitutes a billable lead before you sign up. Ideally, you should only get charged for leads from the homeowner or decision maker calling about a service that you offer in an area that you work in. Avoid companies that are vague about their billable terms or charge you for wrong numbers, tenants, or people looking for services you don’t provide. There should also be a process for disputing leads when you disagree on whether it was billable. Obviously, you may not always agree, but there should be some process in place for these situations. This could result in a refund, service credit, or settling for less. Stay away from companies that don’t have a process for disputing billable leads, as you are likely to have customer service issues with them. You should also have the ability to pause your account. This way you can stop getting leads when you are at capacity or just need a night off. Be cautious of using networks that do not allow you to pause your leads. Some companies require you to sign a long term contract for leads. Some contractors are for a period of time, like 3, 6, or 12 months, while other companies require you to sign up for a specific number of leads. Some lead generation companies will charge sign up fees, monthly fees, or other service charges. Make sure you ask about all of the fees before signing up and consider avoiding companies that have high fees just to join or stay in their network. At 33 Mile Radius, we generate live, exclusive phone leads. When you answer the lead, you are the first person speaking to a customer looking for services you provide in your immediate area. Our leads start at $60 and increase from there depending on the service area and lead type. Our criteria for billable leads are the homeowner or decision maker calling about a service you are signed up for in an area that you are active in. We record every lead and you can review and dispute billable leads at any time. You can pause your account at any time and there are no long-term contracts or hidden fees. For more information about our lead prices or other conditions, fill out the contact form below and someone will reach out to answer your questions within 1 business day. 33 Mile Radius provides high-quality phone leads for contractors through a variety of digital marketing techniques. In addition to paid search campaigns and organic search content, we use a variety of other advertising and marketing strategies. Plus, we are always exploring new ways of generating leads for our contractors. Hopefully, you are tracking the success of all the channels you use to generate leads. However, this is especially important if you are purchasing leads. Not only do you need to track the cost of your contractor leads, but also your revenue and profit too. Whether you use your business management or account software or just a simple spreadsheet or notebook, you need to keep track of the numbers to see what marketing channels are performing the best. When buying leads, we suggest that our partners take at least 10 billable leads before evaluating or changing strategies. Remember, leads are opportunities and not everyone will work out. By waiting until you’ve gotten 10 billable leads, you’ll have a better idea of the average type of calls you’ll get. One thing to remember when tracking leads generated from your own marketing efforts is to calculate the cost of your time. Whether you’re managing your paid search account, posting on social media, or writing SEO content, all of those things take time. Another thing to consider is the volume and quality of the leads. While you may get a lot of leads through Facebook, how valuable are they if most of them are price shoppers that don’t follow through? Buying leads from a lead generation company like 33 Mile Radius might mean a lower volume of calls but they could be more valuable to your business if they convert into jobs at a higher rate. If you’re ready to learn more about 33 Mile Radius’ live and exclusive contractor leads, fill out the form below and one of our business development managers will contact you in less than 1 business day. Alternatively, you can call 888-594-8381 now. If you’re already a partner and want to increase the volume of contractor leads you’re getting, call your account manager today. They can help you add new counties or lead types like mold removal leads and plumbing leads that will increase the number of jobs you close.